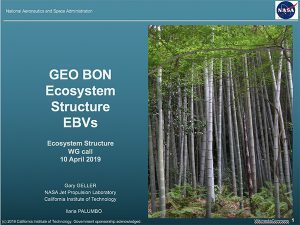 The Ecosystem Structure EBV class encompasses the condition of the structural components of ecosystems that lead to, and maintain, biodiversity characteristics. 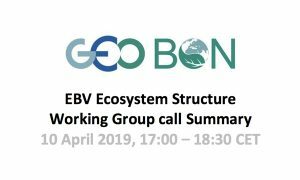 The Ecosystem Structure WG focuses on the monitoring of the relevant EBVs, and how they are changing in time. Identify and agree on a set of EBVs that characterize the structure of ecosystems, its relationship to biodiversity, and that facilitate monitoring change. Develop an explicit definition for each EBV, including any sub-variables. Identify the in situ and remotely sensed observations needed to generate these EBVs, and facilitate the acquisition of and access to these observations. Facilitate mechanisms to generate the identified EBVs and sub-variables and make them accessible. Work with the various BONs to provide guidance on the observation systems and facilitate the acquisition of in situ data pertinent to ecosystem structure. Relate the Ecosystem Structure EBVs to policy relevant outputs, particularly indicators for the CBD targets and SDGs. RS derives EBVs such as Leaf Area Index (LAI), leaf chlorophyll and vegetation phenology, as well as a higher-level indirect EBV, namely Functional Diversity (FD) (the range and relative abundance of traits within a plant community) will be retrieved. Link with other WG, BONs, TF This activity will be supported by the Remote Sensing TF. 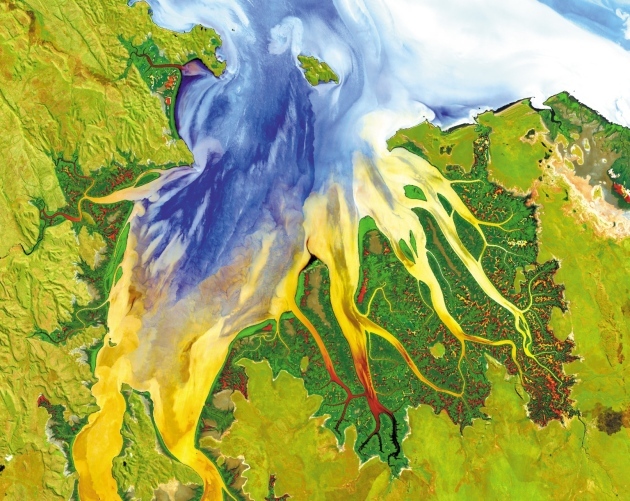 Description We propose to create and validate a global layer of vegetation cover (as percentage of cover) based on MODIS images with monthly variation that can be used as a critical support for several indicators related to hydrologically based environmental modelling. these scenarios will be recorded, such as: spatial and temporal resolutions, extent, location, model used, and contact information. 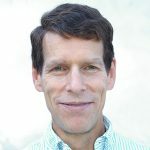 Such database of metadata, and whenever possible the data itself, will be the basis of a web portal, to facilitate the access to existing LULCC by policy and decision makers, thus contributing to a more comprehensive view and a greater utility of these scenarios in supporting policy- and decision-makers. monitoring would allow decision-makers to assess not only the impact of changes in commodity prices (e.g. timber value), but also the success of implemented conservation actions (e.g. promote forest regeneration), and to tackle illegal deforestation activities, thus having a comprehensive picture on the dynamics of forest cover change. In this activity, a fully-automated tool will be developed to track forest dynamics in the Atlantic Forest of Brazil.